Abbey Gardens | Williamson Williamson Inc.
Abbey Gardens is the master plan proposal for a prototypical community village which aims to service its immediate locale as well as a broader regional audience for those interested in food for consumption but also for those interested in food’s impact socially, agriculturally, economically, nutritionally and culturally. 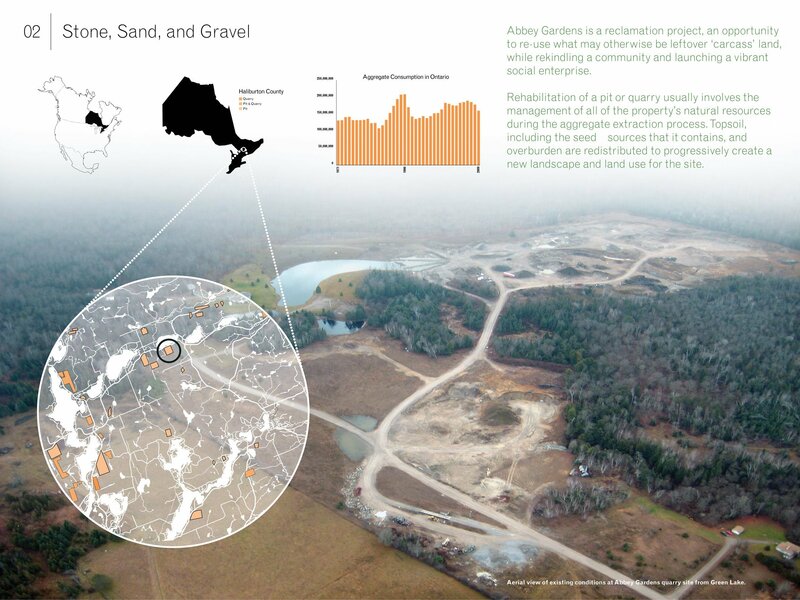 The scheme is centred around selective built projects which would stitch into existing open ‘rooms’ left behind what was once a gravel quarry — on a 441-acre lot two hours north of Toronto in Haliburton, Ontario. Abbey Gardens may be seen as a reclamation project in two ways: a) it is a project whose aim is to adaptively re-use what may otherwise be a leftover ‘carcass’ land in a region in Southern Ontario known for its lush mix of deciduous and coniferous forests interspersed with freshwater lakes, b) it also aims to revisit food as the binding agent towards building sustainable communities by providing a long-term framework for sharing food and sharing ideas. Through a series of modular greenhouse structures which can grow in stages, the flagship structure known as The Cradle would shape itself along a cresting path which houses a public viewing loggia. This loggia would structurally support a climate-controlled trunk route which would accelerate efficient ventilation and air exchange by virtue of the tapered tower stack — which doubles as the lateral-resisting side core for a nine-storey Food Spire. 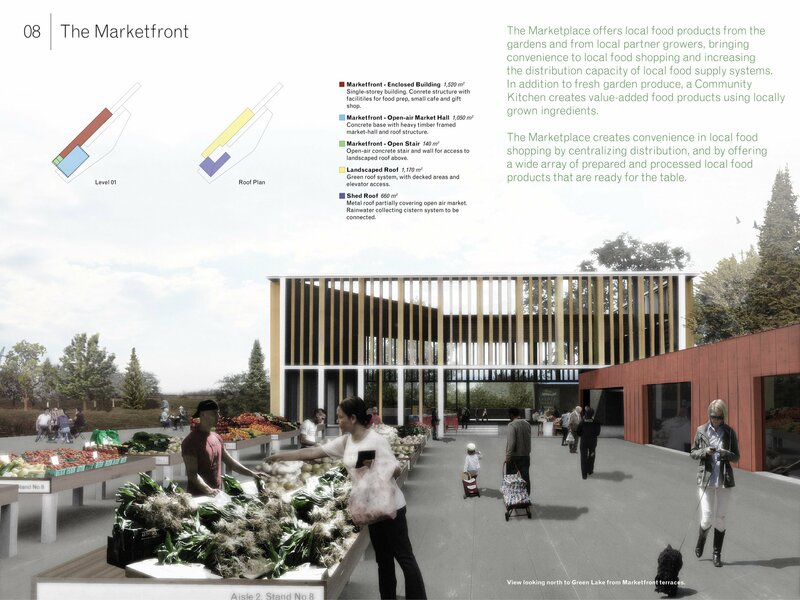 The loggia would weave independent cross-traffic for viewing and study overhead, with underpasses which lead the open-air Agricultural Fields through vomitories towards the interstitial spaces knuckled between standardized modules of terraced greenhouses. 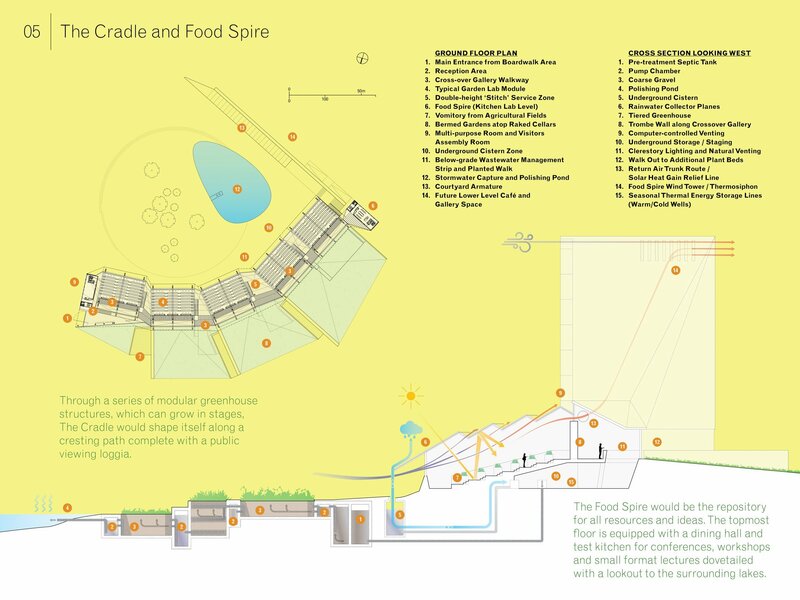 The initial built project of The Cradle would begin with a series of greenhouses finishing with the Food Spire, and then be flanked with a low-level armature housing a visiting centre, gallery spaces and a public restaurants which provide menu-tasting of local foods. 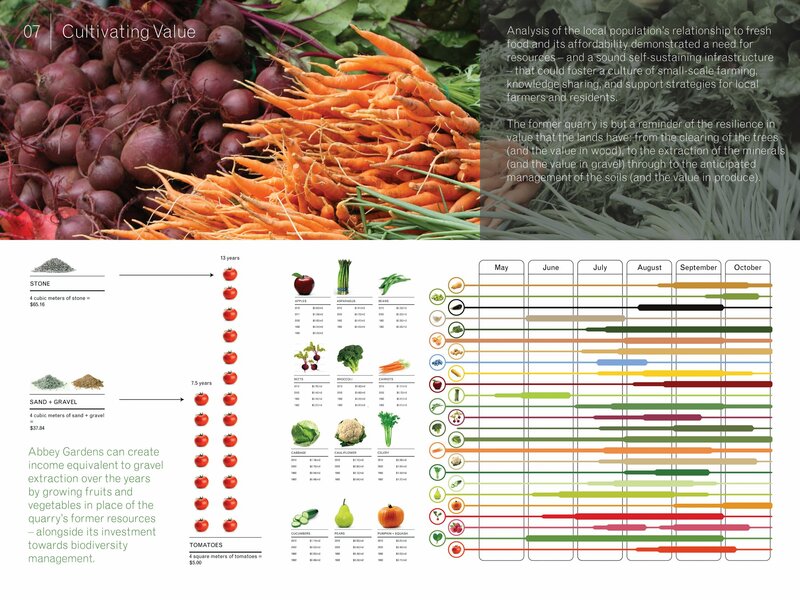 Conferences for lectures which would be known as ‘Thought for Food’, with the aim to appeal the emerging breadth of people who find food to be central to their disciplines and/or interests. 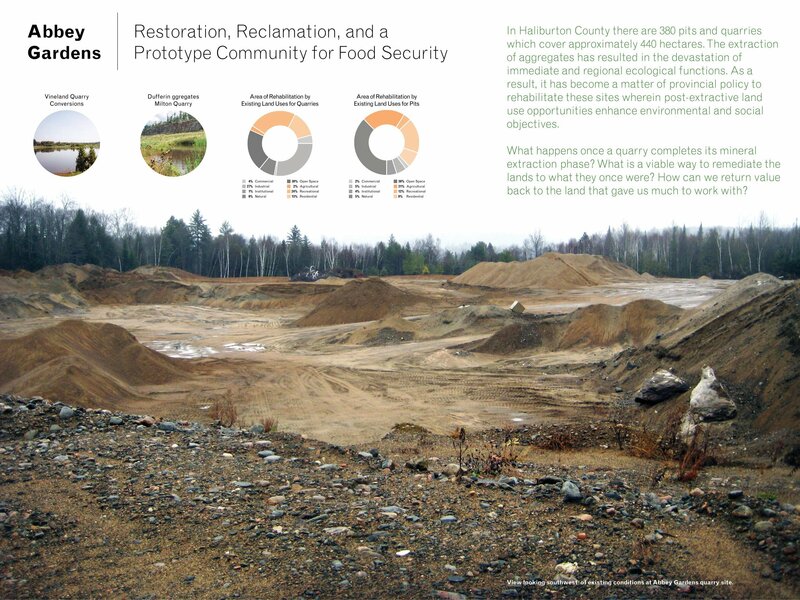 The Food Spire would be the repository for all resources and ideas in the form of traditional library-format stacks but also open-source media storage and retrieval. 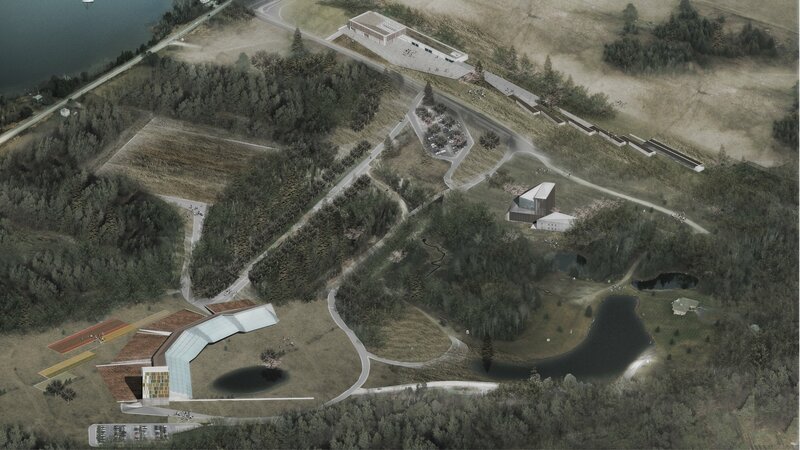 The upper-most floor is equipped with a dining hall and test kitchen for conferences, workshops and small format lectures dovetailed with a lookout towards the surrounding lakes. It will also provide an observation laboratory in which to survey growth patterns, wind and climatological conditions over time and calibrated for the possibility of sharing data across similar points throughout the region. 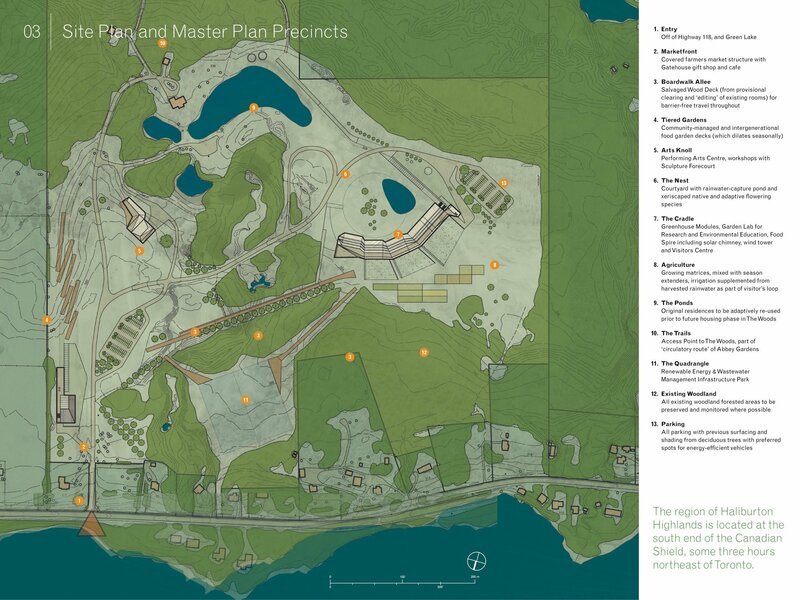 It would also help to position future components of the community village which would may include a facilities for centralized energy distribution, arts/performing spaces, housing, food markets, and a salvaged-tree boardwalk. 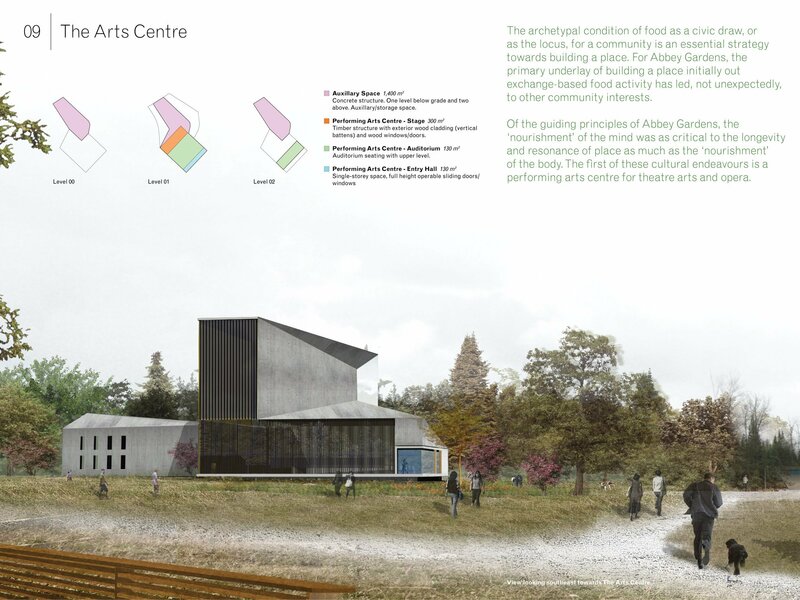 Using the artists-in-residence format, people from all walks of life who in their own way engage food — nutritionists, agriculturalists, urbanists, chefs, farmers, food policy planners — could find a home at Abbey Gardens (in the Food Spire) where seemingly disparate interests can provide a place for a healthy coalescence of advanced thinking. In many ways, the gardens can be an ‘abbey’ where ideas are cultivated and developed with thorough study, focus and collegial input. 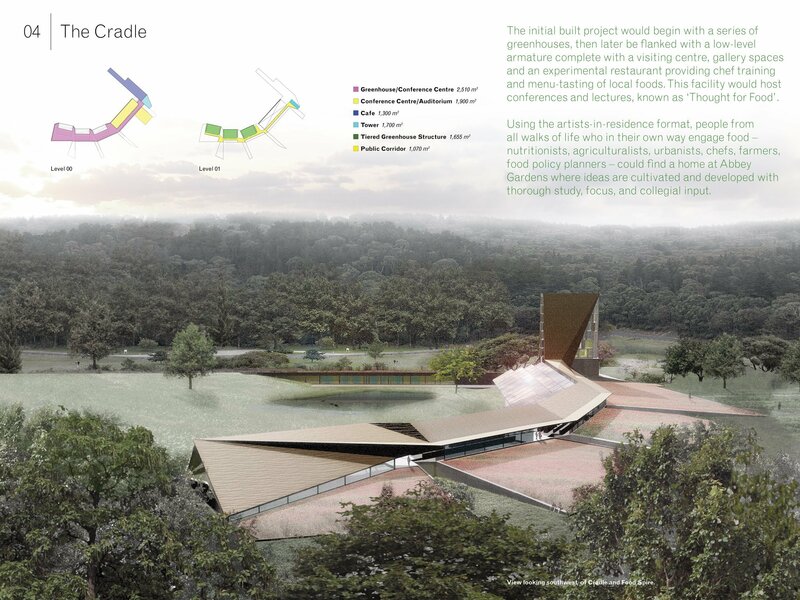 As the flagship project — which is positioned to grow in modules around a solar-optimized arc facing south but with slightly varying angles — The Cradle would frame the forecourt Nest, which would draw any water from the south-facing sloping surfaces. 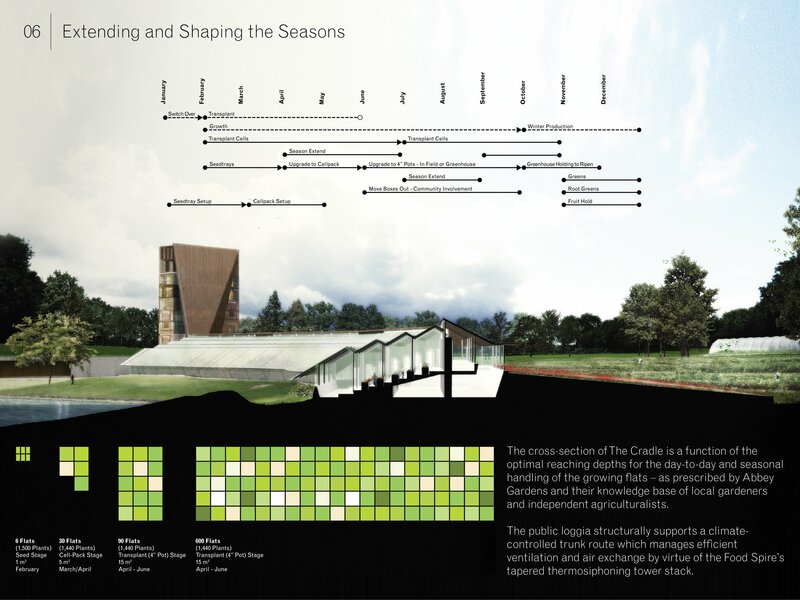 The Cradle frames the moat-like liner which is configured with a masonry-wetland-cistern strategy for gravity-drawn natural filtering in a xeriscaped landscape to enhance local flora and fauna activity. The Nest is the new forecourt to this articulated arrangement of greenhouses, which are strung along with a common upper ‘loggia’ which provides public access and an opportunity to view the ‘operative cross-section’ of the greenhouse-to-field processes. Along this central ‘street’, a ventilated trunk system provides significant air collection and exchange routes propelled by the Food Spire’s tapered thermal stack, which exhausts any expelled air well away from fresh air coming in low from the vomitories and east side low-slung roof. Ventilation would be customizable to each module, to provide different ‘regional’ modules — thereby providing proper testing grounds, while producing food along the way. 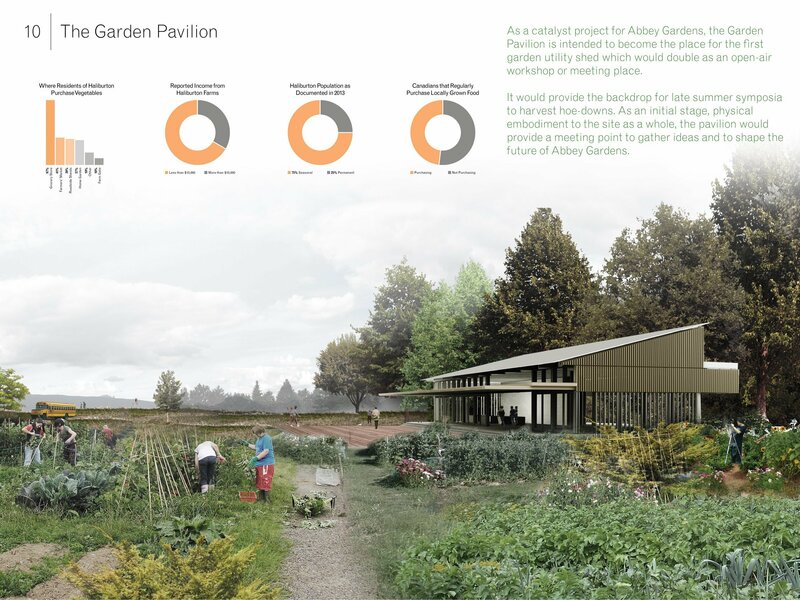 Modules on weekends and evenings would also provide participatory community seminars for nearby residents hoping to engage in their own growing techniques both at Abbey Gardens and their own homes.